Note: see LEEDer Boots mentioned below in this comprehensive NHS Clinical Nurse’s article. Original PDF link at end. The most recognizable causes of ulceration are pressure, shear and friction. When considering the heel area these forces can be created in various situations, such as when patients use their heels to push themselves up in bed and in cases of poor manual handling.Although there are numerous heel pressure-relieving devices available, all choices must be underpinned by good communication, knowledge of the pathogenesis of pressure ulceration, and holistic patient assessment. Patients are at risk of developing pressure ulcers, especially on or around bony prominences, such as the heel. The heels are the second most common site of ulcer development after the sacrum Cheneworth et al, 1994). This is because of the thin layer of subcutaneous tissue between the skin and the bone, which provides minimal protection from the applied forces of pressure, shear and friction (De Keyser et al, 1994). In some patients, these forces can lead to occlusion of the blood supply to the heel. Prolonged occlusion leads to local ischaemia, resulting in necrosis of the surrounding tissue (Hampton, 2003) and ulceration. The incidence of heel ulcers is increasing within the inpatient population (Meehan, 1994; Collier, 2000). They result in increased morbidity and mortality, place a financial burden on the NHS (Bennett et al, 2004) and increase patient’s pain and suffering (Hampton and Collins, 2004). Thus, appropriate prevention and treatment of heel ulcers is vitally important, and consideration must be given to the use of appropriate pressure relieving devices. The reduction of pressure at the site of an ulcer will aid the micro-circulation of the area, prevent further damage and act as treatment University of York, 1995). The use of pressure relieving equipment in the at-risk patient as determined by the use of a risk assessment tool in conjunction with clinical judgment can also reduce the risk of ulcer development. Pressure ulcers are caused by a variety of intrinsic and extrinsic factors (Banks, 1997). The National Institute for Health and Clinical Excellence (NICE, 2005) identified common factors that create vulnerability to pressure damage (Table 1). Maklebust and Sieggreen (1996) suggested that the most recognizable causes of ulceration are pressure, shear and friction. Shear is a force that is applied tangentially or in parallel, in all directions (Bliss, 1993). Phillip (2003) gives a similar definition of shear as being: “…the stress resulting when one body attempts to slide past another and encounters resistance.” In the case of the heel area, shear forces are encountered when sliding down in a bedside chair or in bed. An ergonomically poor position in a bedside chair also increases the risk of these forces. Collins (2000) associated sitting out of be with the heels on the floor with the development of ulcers. Indeed, the patient who slides down in a chair with his or her heels firmly pushed into the floor will cause tissue damage and subsequent pressure ulceration. Friction is caused by the rubbing together of two surfaces (Hampton, 2003). It can occur when the skin rubs against bed sheets or the floor, and during poor manual handling techniques. Examples of poor manual handling include leaving hoist slings or slide sheets under patients, which can lead to tissue damage, and the use of short slide sheets that protect the sacrum but leave the heels to be dragged against the bed sheet during repositioning. Pressure is the force that is applied vertically to a surface (Hampton, 2003), and occurs when patients are not regularly repositioned if they are unable to move themselves. In addition to the external factors of pressure, moisture, friction and shear, there may also be specific factors that predispose individuals to ulcer development on the heel: Arterial disease can be present at both a macro- and micovascular level, including neuroischaemic and autoimmune disorders (Hampton, 2003). Diabetes can affect the neuropathic pathways and includes both sensory and motor neuropathy: sensory neuropathy occurs when the sensory nerves are damaged, resulting in the loss of sensation and potential risk of unrecognised injury and possible necrosis and/or amputation (Hampton, 2003); motor neuropathy causes muscle wastage and subsequent foot deformity. Anti-embolic stockings should not be used for patients with arterial disease, diabetes or rheumatoid arthritis without Doppler ultrasound as they can cause occlusion and damage to poorly perfused heels and feet (Hampton, 2003). Medications that induce sedation and/or anaesthesia and medical/surgical interventions also reduce the frequency of movement and lower the perfusion of blood to the peripheries, which increases the risk of tissue damage (Hampton, 2003). Underlying disease processes such as multiple sclerosis and immobility of the lower leg as a result of injury and/or paralysis also increase the risk of ulceration (Collier, 2000).When assessing the individual patient, the clinician should always consider these factors. 1984), thus resulting in damage. This is also known as the cone of pressure (David, 1983). There are a variety of risk assessment tools that are available within the NHS; the tools most frequently used have been devised by Waterlow (1985), Norton et al (1962) and Braden and Bergstrom (1987). These tools aim to identify the patients who are at higher risk of pressure ulcer development and are designed to be used in conjunction with the practitioner’s clinical judgment (Cullum, 2001). Cullum (2001) and NICE (2005) recognise the need for the risk assessment to be completed within six hours of hospital admission, and at regular intervals post-initial assessment. Assessment of the heels should be included as part of risk evaluation, but it has been suggested anecdotally that this area is awkward anatomically to assess in the bed-bound and seated patient and, as such, is not regularly observed. [LG Note: KYDEX-PRO boots have an inspection window at the heel from both sides to make heel assessment easier] If this is the case, there may be a need to incorporate the heel inspection within another aspect of care, such as personal hygiene needs, to ensure the heels are examined during washing. It is imperative that any findings are documented and/or relayed to the appropriate member of staff. It is also vitally important to remember that the completion of any risk assessment tool and skin inspection must be acted upon. Flanagan (1993) noted that a risk assessment becomes a pointless exercise if preventative measures, such as the use of pressure-relieving products, are not implemented. Providing pressure-relief.The first step in pressure ulcer prevention is for healthcare professionals to reposition patients who are unable, or unwilling, to do this by themselves. The NHS Quality Improvement Scotland (NHS QIS, 2005) suggest that patients should be positioned adequately to minimize pressure, shear and friction. An ergonomically good seating position. All of these should be documented to ensure good communication between the multidisciplinary team involved in patient care, to show evidence for the treatment provided and to give a rationale for the provision of pressure-relieving equipment. NICE (2005) state that all patients assessed as being at risk of pressure ulcer development should be provided with a high-density foam mattress to redistribute pressure. Sideranko et al (1992) suggested that the support surfaces on which patients are nursed influence the development of heel pressure ulcers (Collier, 2000). When considering dynamic mattresses and overlays it is important to ensure that good assessment directs need and provision, and considers patient choice. NICE (2005) provides guidelines for underpinning mattress choice, including factors such as the need to identify risk within an holistic assessment, the patient’s previous history of pressure ulcer prevention, individual clinical history, and when other low-tech devices have failed. The use of these types of mattress, however, does not mean that the patient is not repositioned if he or she is unable to move, or that regular assessment of the individual should not occur. 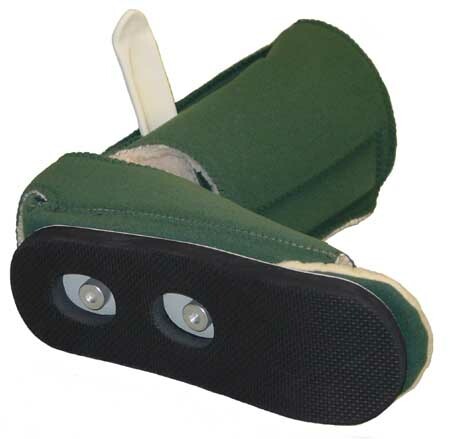 The use of further pressure-relieving devices may also be necessary, especially at the heel area. Anatomical position of the ulcer site (Wilson, 2002). All of these should be considered in conjunction with the need for evidence-based practice and the examination of current research/literature relating to the individual products. The examples of pressure-relieving devices below is not exhaustive, but provides a selection of some that the author has experience of using in her trust. The sheepskin boot is an example of ritualistic and non-evidence based use of equipment for the prevention of pressure ulceration that is still used by many people today. Dealey (1991) suggests there is no evidence to support that sheepskin boots reduce the incidence of ulceration or provide direct pressure relief. Indeed, according to Russell et al (2000), their use could result in pressure ulceration. [emphasis added LG] Additionally, the RCN (2001) support the recommendation that sheepskin boots should not be used as a pressure-relieving aid. They are, however, considered as a comfort aid but should be used with caution, and care is needed with regard to cross-contamination and laundering (RCN, 2001). 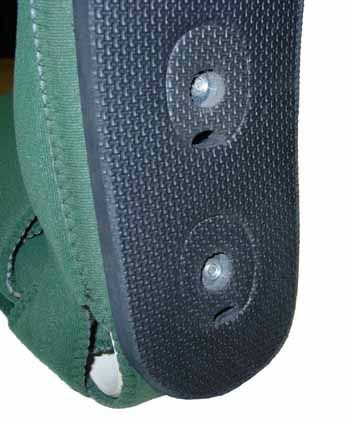 A more suitable choice of device for the relief of pressure at the heels is the heel-lift suspension boot (Figure 1). 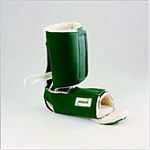 This is a suspension boot for use in patients who are confined to bed, and has anecdotally been suggested to produce a good level of pressure relief. The boot relieves pressure by suspending the heel in a cavity space and may be used for pressure ulcer prevention and treatment. It is made in soft foam and has adjustable hook-and-loop straps and elevation pads, which reduce friction and enhance movement in bed. It is hand washable and is a universal size (one size fits all). incorporated pressure-relieving splint that rests the heels while protecting the malleoli with air-filled compartments. The protector is most effective in patients confined to bed or in those with their feet elevated, and can be cleaned with soap/detergent and water. The device is easy to use; Wilson (2002) found that these protectors were successful in preventing heel ulceration in her postoperative evaluation of the product within an orthopaedic unit. Pressure-relieving devices may be used in conjunction with an appropriate mattress to ensure pressure is relieved at the heel. All choices of equipment must be underpinned by good communication, adequate knowledge of the pathogenesis of pressure ulceration, holistic assessment and, where possible, be evidence-based. However, there is limited research to support the use of many of these devices, with most of the support being anecdotal and/or experience driven; thus further examination and research is needed. The heel is a bony area with little tissue cover, which is prone to pressure ulcer development. The most commonly suggested causes of ulcer development are pressure, moisture, friction and shear, but in the heel area there may be specific factors that predispose individuals to ulcer development. Assessment tools aim to identify the patients who are at higher risk of pressure ulcer development and are designed to be used in conjunction with the practitioner’s clinical judgement. Appropriate treatment of heel ulcer sites is vitally important, and consideration must be given to the use of appropriate pressurerelieving devices. The choice of pressure-relieving equipment should be considered in conjunction with the need for evidence-based practice and the examination of current research/literature relating to the individual products. Bennett G, Moody M (1995) Wound Care for Health Professionals.